Drs. 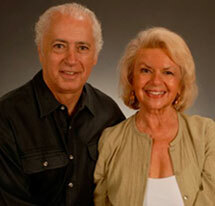 Evelyn and Paul Moschetta are marriage counselors, therapists and workshop leaders, working in NYC and happily married for over thirty years. With offices in Manhattan and East Hampton, New York they are experts in helping individuals and couples solve personal and relationship problems. They work individually or as a co-therapy team. Both Drs. Evelyn and Paul Moschetta hold doctorates from Yeshiva University in New York and have studied at the American Institute for Psychotherapy and Psychoanalysis and the Alfred Adler Institute. For many years they were contributing editors to the Ladies Home Journal magazine long running and highly popular column "Can This Marriage Be Saved?" The Moschettas were named Marriage Counselors of the Year by the Long Island Association for Marriage and Family Therapy. They are the authors of Are You Roommates or Soul Mates?, The Marriage Spirit (Simon & Schuster 1998) and Caring Couples (1990) They have conducted marriage enrichment workshops throughout the country and appear as guests experts on marriage for many national media outlets. "each time a problem is not solved amicably, each time an appropriate expectation gets disappointed, and each time there is a hurt that is not healed, there are varying degrees of negative feelings created." Questions? Call now we are here to help.